Adam’s Curry House on Alosvat Guliyev Street is the only dedicated curry house in Baku. There are a few pubs that offer a weekly curry night, but Adam’s is the only seven-day operation in town. This family run establishment has been operating in the capital of Azerbaijan for 15 years, so if they can’t get the ingredients then no one can. Coriander, however, is available on, more or less, every street corner. This staple of the curry world is straddled alongside imported cigarettes and pomegranates on many a hand cart or Del Boy-style cardboard box. The decor of Adam’s Curry House is very yellow; the walls, ceiling, tables are all yellow, plus the numerous collages of ex-customers, of the expat variety, that adorn the walls are various shades of yellow, dependant on age. The menu has many of the old favourites of the chicken or lamb variety, with the addition of ‘Adam’s specials’ that seem to be either from Goa or Northern India. The Goan fish curry first caught my attention. This is a family favourite, or as the menu explains, ‘Mom’s Goan fish curry’, priced at 16 Azeri manat (£12.60), but I chose a dish that I’d not tried before, the Malvan chicken curry. ( 15 Azeri manat/£11.80) A curry in this town is not cheap! Oil wealth has a way of inflating prices, especially when you’re attracting a mainly expat community. The menu says this curry is from the Malvan region of Maharashtra. The ingredients are dried red chillies, coriander seeds, cloves, black pepper corns, fennel and cumin seeds, masala ilaichi (black/brown cardamom ), cinnamon stick, dagad phool (a type of dried lichen mostly found in mountainous regions, a most unusual ingredient in a curry) and negkasar with black mustard seeds, dried turmeric root, badal phool, (star anise) whole asafoetida stones and two whole nutmeg. All of these are roasted and ground to create the masala sauce that is hot and has a slightly bitter taste. The dish was served with a plain rice ( 7 Azeri manat/£ 5.50 ) that mediated the slightly bitter after taste, to pull the balance of the dish back. 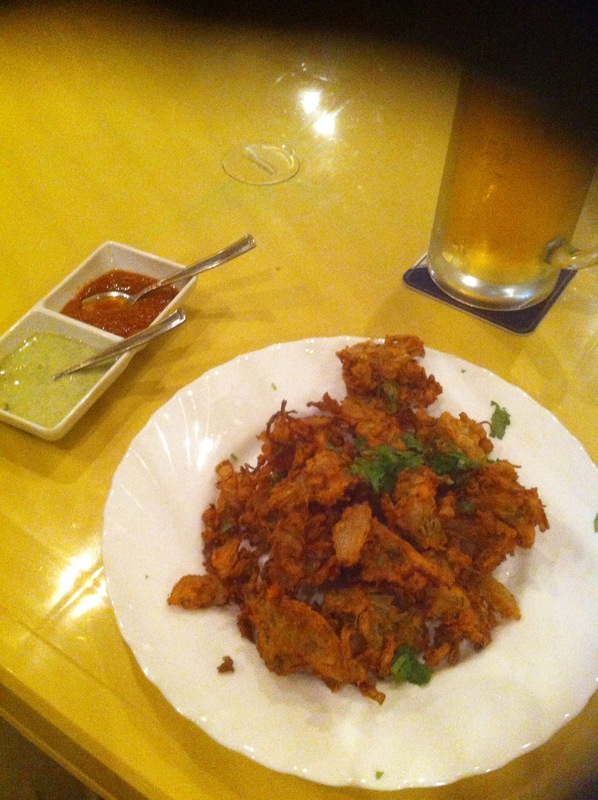 This was accompanied by onion bhajii (6 Azeri manat/£ 4.70) that were homemade, light and crispy. I think we have unfortunately become used to a big tennis ball type of bhajii full of oil and barely cooked in the centre, rather than these delicate, flavoursome starters. It’s a shame that many of our curry houses have adopted this approach rather than going back to the original idea of the bhaji as a light street food snack. Overall, the meal was very tasty and filling, the service came with a smile from one sister, while the other sister had a face like someone had just slapped her with a fresh herring. It was a confusing double act. So, was it worth it for roughly £28 for one person? Probably not. 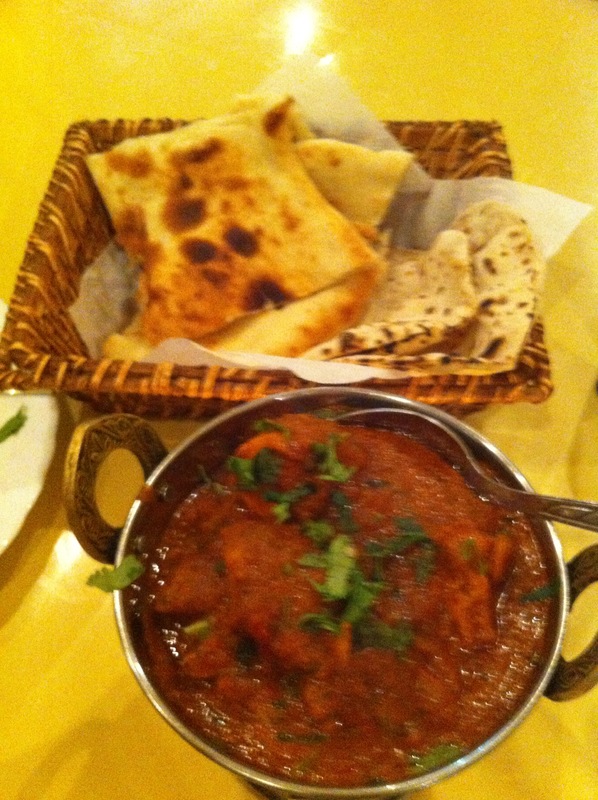 However, they have a captive audience and an expat community that loves a curry.